Metis is a cloud-based professional services automation (PSA) system that helps ambitious professional service businesses significantly improve their profitability. The software is intended for teams composed of up to 100 people who need to graduate from ad-hoc tools and spreadsheets to a powerful and robust platform to create the business. Metis combines sales pipeline management, job profitability control, resource planning, timesheet and expenses capture, and time-off management into a unified solution that is expertly designed and one that the whole team will find easy to use. With such a powerful application that enables users to gather, manage, and analyze tons of information from a single place, Metis delivers 20:20 foresight to users. This foresight is basically the insights you need to make smart business decisions and help you grab and capitalize on opportunities as well as uncover potential problems and quickly address them before they become harder to solve. Metis is a professional services automation (PSA) solution that caters to businesses that offer advice, support, and creativity services, enabling managers and supervisors to get on the same page with their teams, delegate tasks without giving up control. The system is designed to help businesses achieve profitability while at the same time, provide quality service to their customers. Metis is basically a great solution for companies that require a comprehensive solution that allows systems to communicate with each other instead of spreadsheets and applications that don’t mesh well together. With Metis, you get the whole picture of your business while being able to drill down to the minutest details. Intuitive dashboards grants you total control and you are able to see problems and issues and address them before they become full blown. Simply put, Metis helps you concentrate on the important things rather than dwell on aspects that cost you time and money. Metis helps you increase your profitability by helping you determine which clients are projects represent the most profits. The software equips you with tools you need to plan and re-balance your sources. You can also follow your project margins and compare your actuals against your budget. Key cash flow indicators help you see which projects and individuals are pouring in the money to your business. The software helps create reliable projections of your people needs as well as future revenue as well as manage your entire sales pipeline. Metis lets you monitor the sales performance of your teams and identify the areas where they excel and areas that require attention. Profitability means getting the most of your time and expenses. Metis allows users to capture time and expenses effortlessly and add receipt images as reference and support for expenses. What Problems Will Metis Solve? 1. Having multiple software products doing different jobs and not talking to each other? Metis integrates all your essential business management applications for timesheets, expenses, sales pipeline, resourcing, job budgeting and forecasting into a single unified and user-friendly platform. 2. Unclear which clients and projects are profitable? Metis is a cloud platform that enables professional service businesses to achieve better profitability by ditching the spreadsheets and ad-hoc tools that most firms use to run their business. Instead, Metis provides a single solution capable of handling sales pipeline management, job profitability control, resource planning, timesheet and expenses capture and time-off management. 3. Having difficulty in gathering data and creating future forward strategies? Metis delivers a strategic overview of your business based on all of the information it holds. 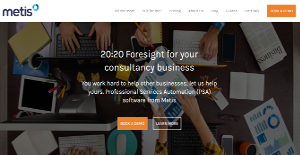 Metis not only reports on what’s happened in the past but gives you the 20:20 foresight you need to manage the future. Companies have different wants and requirements and no software application can be ideal in such a scenario. It is pointless to try to find a perfect off-the-shelf software product that meets all your business wants. The intelligent thing to do would be to adapt the application for your specific requirements, worker skill levels, budget, and other factors. For these reasons, do not rush and invest in well-publicized popular systems. Though these may be widely used, they may not be the best fit for your particular requirements. Do your homework, investigate each short-listed system in detail, read a few Metis reviews, contact the vendor for clarifications, and finally choose the product that provides what you want. How Much Does Metis Cost? We realize that when you make a decision to buy Professional Services Automation Software - PSA it’s important not only to see how experts evaluate it in their reviews, but also to find out if the real people and companies that buy it are actually satisfied with the product. That’s why we’ve created our behavior-based Customer Satisfaction Algorithm™ that gathers customer reviews, comments and Metis reviews across a wide range of social media sites. The data is then presented in an easy to digest form showing how many people had positive and negative experience with Metis. With that information at hand you should be equipped to make an informed buying decision that you won’t regret. What are Metis pricing details? What integrations are available for Metis? Metis is currently not integrated with any other software or services. If you need more information about Metis or you simply have a question let us know what you need and we’ll forward your request directly to the vendor.